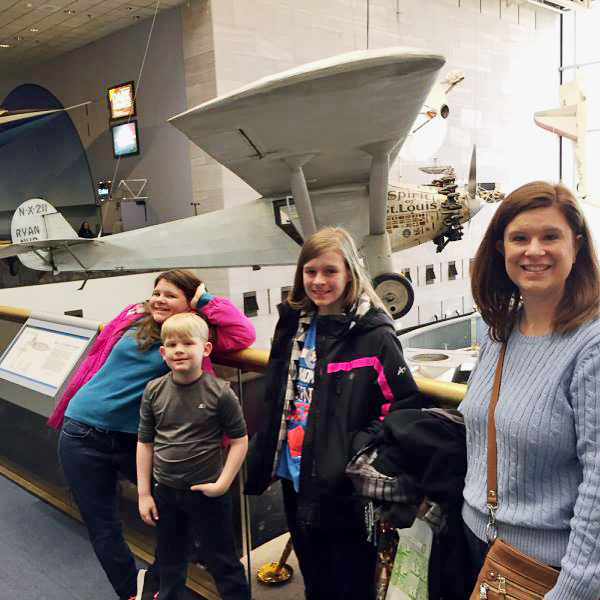 After our meal at the food truck, we took off for our next destination, which happened to be the reason Lauren wanted to visit D.C.: The Air and Space Museum! We didn’t have very far to walk to get to it from the Holocaust Museum. As we entered, we were nervous about Mitchell’s Swiss Army knife (yes, this is the third post about Monday, March 6, so we still had the knife). Terry thought he would see if the museum allowed it. As soon as Terry emptied his pockets at security, a stout looking guard came over and told Terry, “Follow me.” Terry hadn’t even gotten his things from the x-ray belt! The guard led him to the door, opened it, and said, “Get out. We don’t allow any of that in here.” Fortunately, Terry was able to stash it outside somewhere and re-enter. 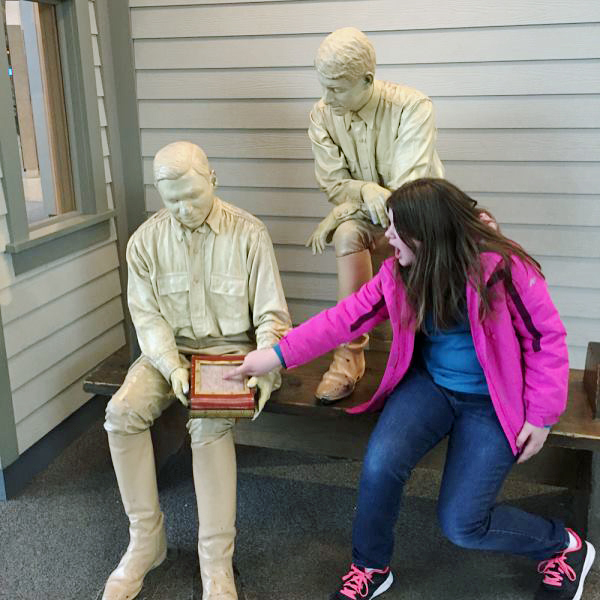 I was holding his cell phone, keys, and billfold, hoping he could get back inside. It was at that moment that I felt a tinge of hatred for our nation’s capital. It might have also been the extreme fatigue setting in, too. 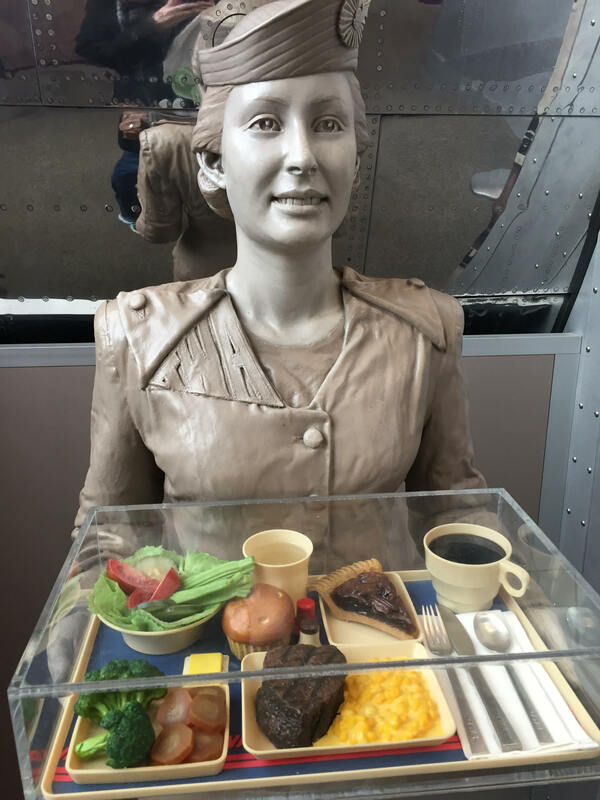 I really did love seeing the actual Spirit of St. Louis, the plane in which Charles Lindbergh flew the first solo non-stop flight across the Atlantic. This was here when I was a teenager, so it felt like seeing an old friend. Still taking turns taking pics! Here is Terry with this famous aircraft. They also had several of the Lindbergh’s things, such as clothing and flight instruments, etc. 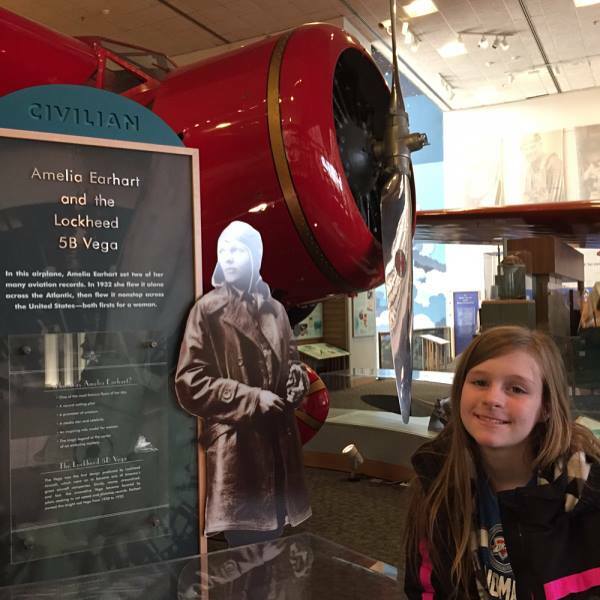 We enjoyed seeing the display area about Amelia Earhart. They had several of her personal artifacts. There was a neat section about Jimmy Doolittle, who not only served our country valiantly in World War II, but he competed in races, and won, in his early career. I didn’t know airplane races even existed. Pretty interesting. This little hideaway was in the Jimmy Doolittle area. 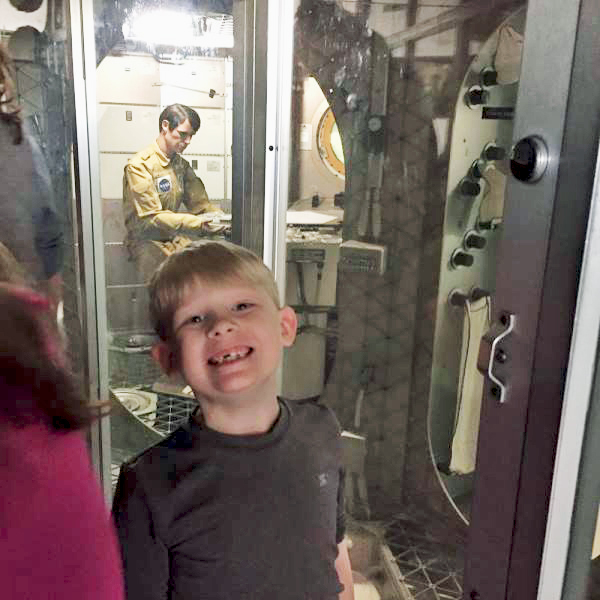 Matthew loved the Space Shuttle we got to walk through. Here he is standing next to an astronaut as he is working. This was a very small exhibit, and nothing was hands-on, so that made it less exciting. I just liked this huge hot air balloon. Laci is inserting herself into a serious conversation about navigation. 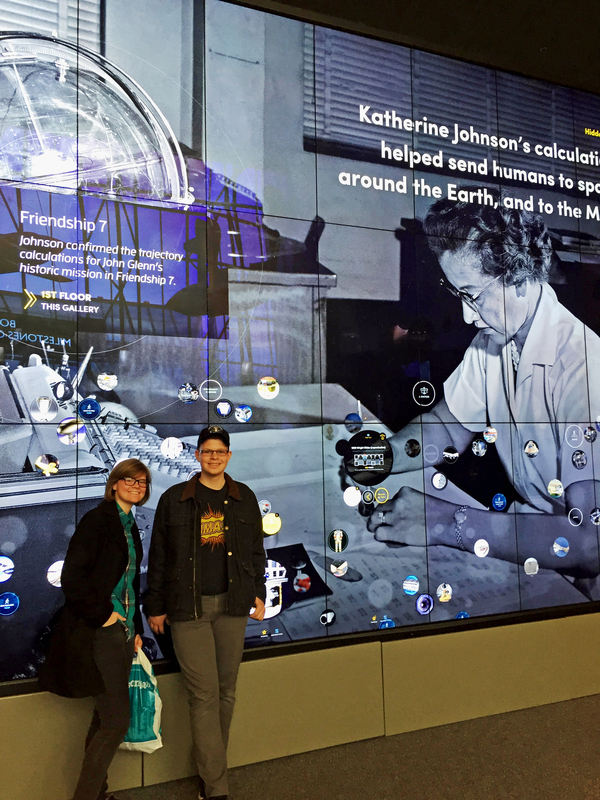 As we were leaving, I got this photo of Lauren and Mitchell with a display of one the ladies featured in the movie Hidden Figures, which Lauren saw and loved. 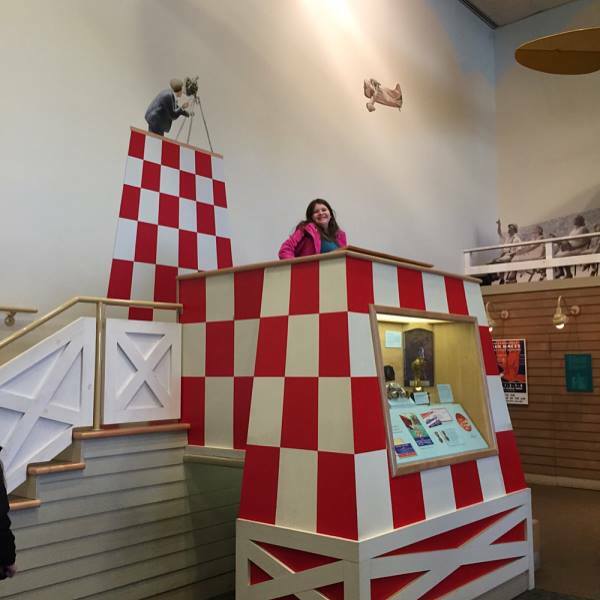 Lauren happily reported that the tour of the museum was amazing. Mitchell was mildly entertained. Lauren enjoyed hearing the little-known facts about all sorts of flying machinery. 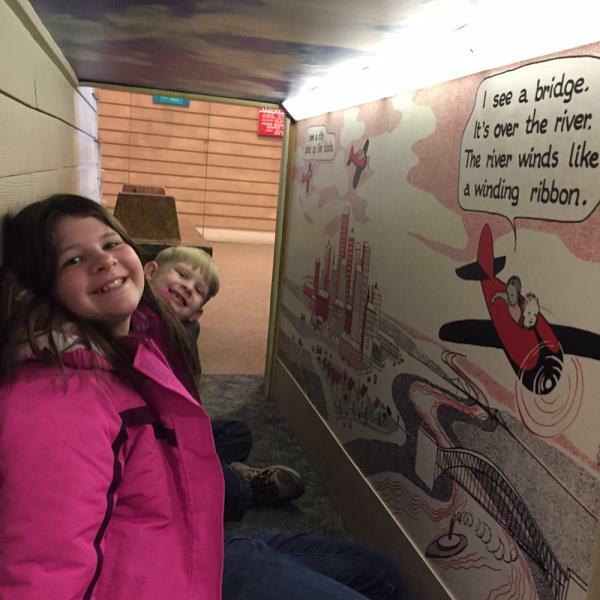 In fact, she decided to forego visiting the Smithsonian Museum of Natural History with us a few days later so she could go back alone to the Air and Space Museum. I think she would go yet again if she had the chance. I was disappointed that the Enola Gay, the plane that dropped the first Atomic bomb, is no longer featured at this particular museum. It’s now at one located in Chantilly, Virginia. I enjoyed seeing that when I came as a teenager and wanted to show the kids. 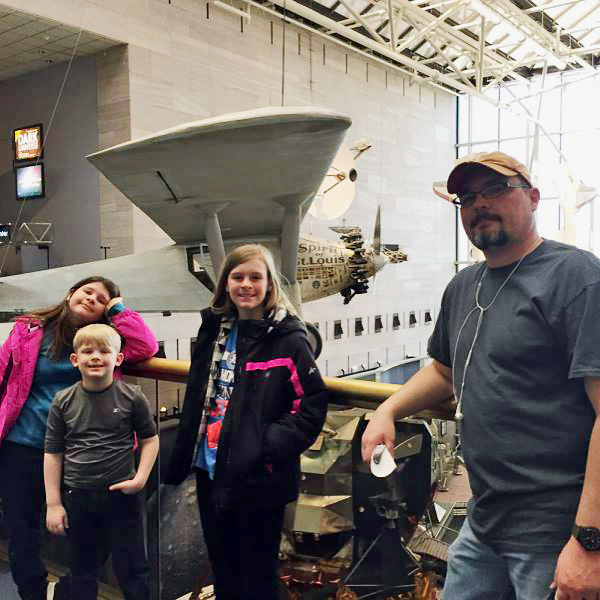 Terry took the three youngest kids on a three-minute flight simulator machine that let the kids do the driving. It even flipped upside down! They got to “shoot” at enemy targets and steer their “plane”. I could hear their squeals of delight ten feet away. It was definitely the highlight for them. It only lasted three minutes, but they thought it had to have been ten minutes. We were able to retrieve Mitchell’s knife, for the last time that day, and begin the two mile walk back to the car. 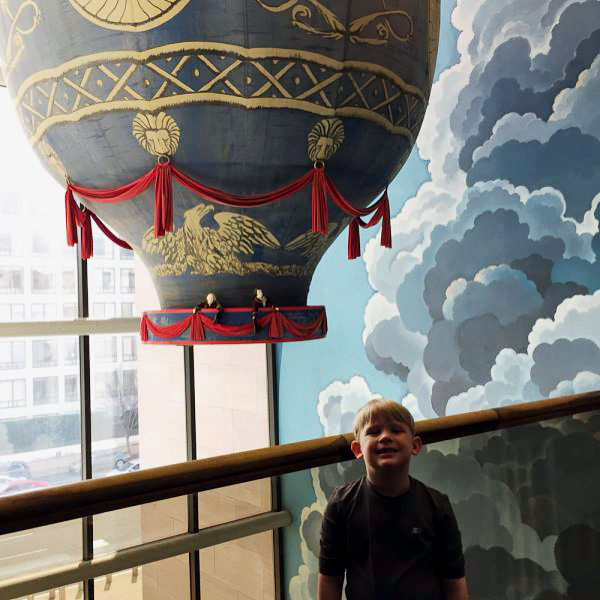 We had had a very fun and eventful first day in D.C.
Now you got me convinced that we need to visit all of these places you recently visited and blogged about. You take great pictures, too. Thanks for sharing this. I literally LOLed at your comment about engines and watching paint dry. I like math and science and I enjoyed this museum when I saw it as a teenager, but I totally agree about engines. I think I liked the Museum of American History? (The one with Old Glory) better, though. That’s something about the security guard kicking him out. He didn’t have to be so rude about it. It’s not like Terry was threatening anybody. Looking forward to your post about the White House! Gracie has said several times that she wants to be president someday so she can live in the White House. The last time, she saw that gleam in my eye and before I could say ANYTHING, she said, “NO, Mama! You can’t come live with me!” LOL!